A popular topic covered in the Nifty Websites Collection is website creation. We’re on a mission to make sure everyone who wants an easy way to create a website, knows the options. 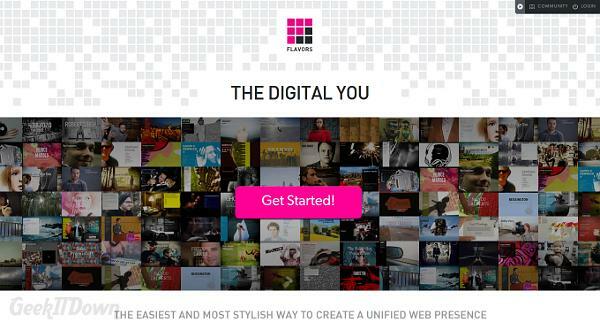 With that in mind, Flavors.me is another outstanding way to take advantage of point and click website creation. For starters, creating a gorgeous web presence or personal space shouldn’t take less than 10 minutes, with Flavors it does. Combine that with zero coding, personalized domain, content inclusion from 35 services, mobile view, statistics tracking and an unbelievably low cost and you’ve got a remarkably full featured aggregator. Flavors offers two packages, Free and Premium. A free account delivers access to 5 services, 222 fonts and 7 layout options. The free plan offers users a simple effective way to create their own personal space. A premium account provides 10 more layout options, access to all services, mobile site view, statistics, contact forms, custom URL and content. The premium account is $20/year. In our opinion, $20 is a fantastic value. Experienced webmasters and those familiar with coding and/or those comfortable with servers and databases might see Flavors as a bit limiting. Flavors isn’t a likely choice if you’re designing a business website or merchant outlet. Instead, Flavors is targeted towards individual web spaces or perhaps those looking to promote a cause. Flavors is a personal portal designed to be simple and concise while at the same time elegant and beautiful. They succeed, but because of that nature users shouldn’t expect a robust selection of interface manipulations. After reviewing sites like Flavors, we’re always left wondering what the web would have been like a dozen years ago if these types of site creators had been around. Not everyone can be a coder and even webmasters can’t be every kind of coder necessary to create wonderful websites. Flavors removes all that trouble and provides a point and click way to design a personal web space for even the most green of novices. Flavors is an incredible value at $20 a year and although the free account is limited in terms of content possibilities, it’s more than adequate for those just getting started.